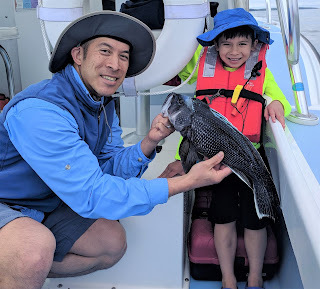 Jamie and Xavier Wong of Cambridge, MA with an early June black sea bass. Once again this year the season in RI is not likely to start before June 24. Steve Medeiros, president of the RI Saltwater Anglers, ‘proposed and supports’ two 16” summer flounder (fluke), from select shore areas. It’s Monday, March 11, 6:00 p.m. and there are well over 100 fishermen and fish managers at the URI Bay Campus to express their thoughts about recreational and commercial fishing regulations for 2019. Most of the regulations that impact anglers were about to be reviewed at a Public Hearing. Participants have an opportunity to express their thoughts about proposed fishing regulation options. The Hearing is part of Department of Environmental Management Marine Fisheries Division procedure (and Rhode Island law). After getting public comment on regulation options they are passed along to the Marine Fisheries Council which is scheduled to meet April 1 to vote on recommendations. The public input, Council and Marine Fisheries Division recommendations then go to Janet Coit, DEM director form her final decision on 2019 season regulations. Commercial and recreational fishing regulations on species such as scup, summer flounder, black sea bass, striped bass and more were reviewed at the Public Hearing. John Lake, DEM Supervising Marine Biologist, did an outstanding job chairing the meeting seeking audience input and keeping what could have been a long meeting on track. Here are some meeting highlights on striped bass, summer flounder (fluke) and black sea bass. Striped bass. The new stock assessment and recalibration of MRIP data is showing that the striped bass stock is overfished and overfishing is occurring. Regulations that utilize this stock assessment data are expected to come into play with the 2020 fishing season. Recreational regulations for 2019 will be status quo (the same as last year). One fish/person/day, a season open year round. Minimum fish size 28”. Additionally, any striped bass, 34 inches and larger must have the right pectoral fin removed upon harvest. Summer flounder (fluke) is not overfished, however, overfishing is occurring relative to biological reference points. A new higher quota, a 73% increase, has been set for the commercial fishery but no increase for the recreational fishery as they slightly overfished their harvest limit in 2018. A status quo option was supported by recreational anglers at the meeting with a minimum size of 19”, six fish/person/day with a season running from May 1 to December 31. 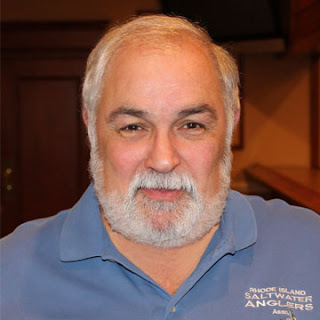 Additionally, the RI Saltwater Anglers Association suggested a Special Shore Provision… a 16” fish, two fish/person/day from May 1 to December 31. If approved the program would run just in special provision locations identical to the provisional scup areas. In regard to the commercial fishery, fisherman overwhelming supported opening the season from four to seven days a week to utilize the 73% quota increase. The commercial fishery was closed on Friday, Saturday and Sunday last year. Black sea bass are not overfished and overfishing is not occurring. A benchmark stock assessment was done in 2016 with no new information at this time. Status quo measures were approved by the Atlantic States Marine Fisheries Commission (ASMFC), the Commission regulates species that migrate along the northeast coast. An update to the 2016 assessment is scheduled for 2019 but may not be available to use for the 2019 season. The status quo regulations the Division is recommending is a 15” minimum size with a three fish/person/day limit June 24 to August 31 and five fish /person/day from September 1 to December 31. Last year DEM recommended (and the Council approved) postponing the season starting it on June 24 to accommodate the RI Party & Charter Boat Association so their members could continue to fish throughout the fall and winter. They are recommending the same this year. A recording of Monday night’s Division of Marine Fisheries public hearing is now available on the DEM YouTube channel. The public comment period ends on March 30. Proposed regulations can be viewed on the Sec. of State website at https://rules.sos.ri.gov/organizations. Go to “Title 250 Department of Environmental Management”, then “Chapter 90 Marine Fisheries, then “Subchapter”. The regulations currently noticed are indicated by the yellow “i” icon. Comments can be submitted in writing/email to: DEM Division of Marine Fisheries, 3 Fort Wetherill Road, Jamestown, RI 02879, Attn: Peter Duhamel/public hearing comments, peter.duhamel@dem.ri.gov. The Rhody Fly Rodders will meet Tuesday, March 19, 6:30 p.m. the Riverside Sportsmen’s Association, 1 Mohawk Drive, East Providence. Peter Nilsen, Roddy Fly Rodders president said, “In addition to the presentation we will be selling flies for this year’s charity ‘Reel Recovery’. The meeting is open to the public.” Contact Peter Nilsen at pdfish@fullchannel.net. The Massachusetts Division of Marine Fisheries (DMF) has set a ten knot speed limit in parts of Cape Cod Bay to protect endangered right whales for ship strikes. The ten knot speed limit will be in effect annually during the months of March and April within those waters of Cape Cod Bay south of 42° 08’ north latitude, this includes those waters north of Cape Cod that are west of 70°10’ west longitude (see map). The term small vessel refers to all vessels less than 65’ overall length. A complementary federal speed limit applies to all vessels 65’ overall length and greater. Visit www.mass.gov/marinefisheries for charts or call 617.626.1520. Cod fishing. Capt. Frank Blount of the Frances Fleet said, “With our new sailing time of 6 a.m. we decided to try some of the local wrecks Saturday. We did find some life on the wrecks with a few nice cod coming over the rails. When steaming between spots we found a good pile of green codfish under the bait. We worked on the area for a few hours but could never get right back on top.” Party boats sailing for cod this time of year includes the Frances Fleet at www.francesfleet.com , the Seven B’s at www.sevenbs.com, and the Island Current at www.islandcurrent.com .